Spacious Mountain Home with View of Lake Gregory. With free Wifi. Chalet, 5 Bedrooms, 4 Baths, (Sleeps 11 plus lots of floor space for more). Welcome to my mountain home located in the very desirable San Moritz area of Crestline and surrounded by tall Jeffrey Pine and Incense Cedar. The home is furnished with mountain style furnishings, many are one of a kind pieces. Conveniently, the home has street level entrance with a parking deck for 2 to 3 cars. No long stairs to get to the front door that is so common to mountain homes with views. Four of the five sleeping rooms have direct access to a balcony looking to the mountains and Lake Gregory. 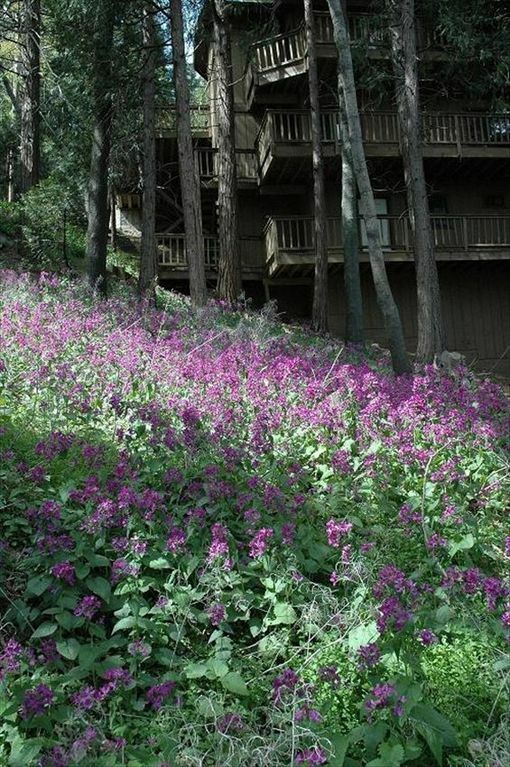 The home is located about 6 miles from Lake Arrowhead and 6 miles from Silverwood Lake. Yet, only 15 minutes drive to the city of San Bernardino. Walk to Lake Gregory and grocery shopping. A skate park for the kids is about 1 mile away. Both Silverwood Lake and Lake Gregory are stocked with fish. You can keep your eye on your little Lake Gregory fisherman from the upper balcony. Goodwin's, a large grocery store, is less than a mile away. The house has three stories, each with its own balcony. Two families will be well accommodated for. The first floor includes the kitchen and family room with a half bath. The second floor has two full baths and three bedrooms. The third floor has a half bath, bedroom with bunk beds, and a family room with a queen bed, couch and table and is well separated from the rest of the house via a spiral staircase and two outside doors, giving privacy to a second family. The queen bed on the third floor, effectively makes five comfortable sleeping areas. As with most mountain homes, my home does not have air conditioning. We are proud of our Lake Gregory. Besides fishing, in the summer it is open to swimming and sunbathing on a well maintained sandy beach. Lifeguards are on constant duty. People come from miles around just to use one of two 300 foot water slides. Available for rent are kayaks, row boats, paddle boats, and electric fishing boats. Motor boats are not allowed on the lake which keeps our lake clean and the fish healthy.In winter, you can ski at two resorts. Snow Valley is about 15 miles away. The home is situated about 4,600 feet in elevation so gets its share of snow. The home is centrally heated as well. Wireless Internet service is provided by Charter Communications. When you rent my home, you will find the kitchen is well equipped to accommodate a large group of people. You do have to supply your own towels and wash cloths and trash bags. We supply the sheets, pillow cases and the blankets. Please note that I have numerous beautifully done taxidermy mounts about the house. All are museum quality. If you do not want to see animal skin rugs and mounted deer heads, etc., please do not inquire into renting my home. The home has a capacity for up to 15 people. However, I have sleeping for up to eleven. State of the art central heating system. For rentals of 5 days or more. Yes. We have Charter Cable internet service at my home. There is also WIFI available 24/7 at the library's parking lot which is just down the road. Dishes and utensils must be clean upon departure. If not, $25 will be deducted. There are three steps to initially enter the main floor. Street Level Entry, Central Heat, outdoor patio furniture. Loved the cabin. It is very spacious and the decor really gets you in the “mountain” mindset. We had an amazing time, if you can I recommend walking the Lake Gregory fitness trail. You're also treated to a beautiful winter storm we love crestline it has kept its small mountain town charm we have not come for quite a number of years and it's still as beautiful as always don't miss crestline Cafe food is great! The house is very spacious and accommodating to a big group. Things do need to be updated but the house is very equipped with what is needed. If you love the stuffed animals then you will like the place but they are in every room and house. At times a little creepy for my taste. However, working with owner was easy. I must respond to this exaggeration. I have museum quality taxidermy that I am very proud of in the living area and two beautifully done pheasants in the master bedroom. That is it. The other four bedrooms do not have any taxidermy at all. As far as "creepy" goes, I guess you never visit museums. This house has a state of the art central heating system and it is about as updated as I want it. I sure wish you could have elaborated on the updating? What was the house missing? The cabin was decent enough for our stay. There was lots of room and the rooms are spaced out nicely. The decor was fun with lots of animal parts around. Heating worked awesome so we were nice and cozy. The owner was easy to work with and we had no challenges during our stay. The 10:00 check-out time was a bummer and differed from what was advertised. At least the owner communicated clearly about it before the trip so at least we weren’t surprised. The cabin could use some TLC, including a deep cleaning and some new carpet, paint, and new window coverings as many were broken and dirty. We realize it’s a cabin but the cleaning crew should still do more for the price that is paid for their service. You could tell they don’t dust much or move furniture to vacuum or get under beds. Location was nice, close enough to Arrowhead and Big Bear so we could get up there for the day. We had a good time and overall, enjoyed our stay. No matter how hard I try, I guess I cannot please them all. The house is nicely set up for two families to share and have their own space. Owner was very accommodating. Parking was tight but we were able to figure that out as well. I recommend this place to anyone wanting to enjoy family friends a lake. It is a wonderful place to get away from it all. We had a lovely time in David's cabin. Very spacious, clean, and had everything we needed. Beautiful quiet area with nice hikes nearby. Would love to come back again! Skate Board Park, County library. Price of $220.00 is for up to eight people. Additional per person will be added for numbers above eight. Prices may change but are locked in with a signed contract. I ask for the fully refundable security deposit of $300 up front and the remainder can be broken down into two payments. In addition, county taxes are 7%.